Harriet Manners is a geek. All the way up until 6th form, Harriet has been the unpopular and nerdy geek girl. Now she's starting 6th form, Harriet is determined that that must change. But with the worst first impressions ever, Nat preoccupied with her new boyfriend and Toby busy with a secret project, Harriet realizes its harder to wipe the slate clean and make new friends than she thought. Hilarious, the 4th book in the series (and my personal favourite), Geek Girl 4 will live up to the almost-as-amazing previous books. Older fans of Dork Diaries will absolutely love this book, and indeed the rest of the series. The writing is so vivid, you feel sorry for Harriet even when it's made to sound funny. With likeable characters, and a great plot, this funny (and relatable, for some) read will keep comedy-loving tweens and teens with a new favourite book! 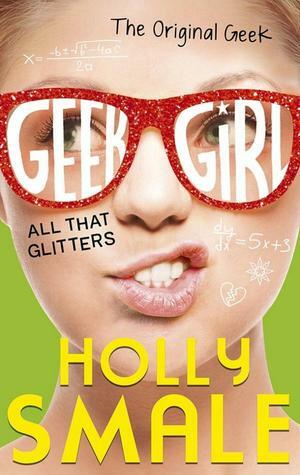 Definitely all girl tweens and teens should read Geek Girl: All That Glitters, even those who aren't the biggest fans of reading, you'll absolutely LOVE this book! It looks like a really good book. I'll see if i can get it. Sounds awesome! I've nominated you to do a 'What I Plan for The Future' on my blog! Great, I'll be getting it up soon! Thanks. Well you should DEFINITELY look out for it then! I will have to look out for this book it sounds great! Yeah, it is a great book, I so recommend it! I will check out your blog now!